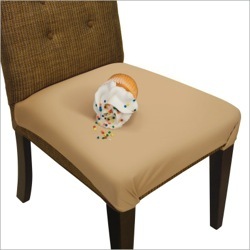 Though they are designed to best fit standard dining room and kitchen chairs, our SmartSeat Chair Protectors are versatile and fit many different sizes and styles of chairs. Though they are not custom fit slipcovers — they are intended to be used as protection against stains and spills and are designed to be removed after use — many customers find the fit to be so good that they choose to leave them on their chairs full time. If you’re having issues getting the best fit on your chairs, we have step-by-step instructions with accompanying photos available on our website. We also are available to answer your questions. 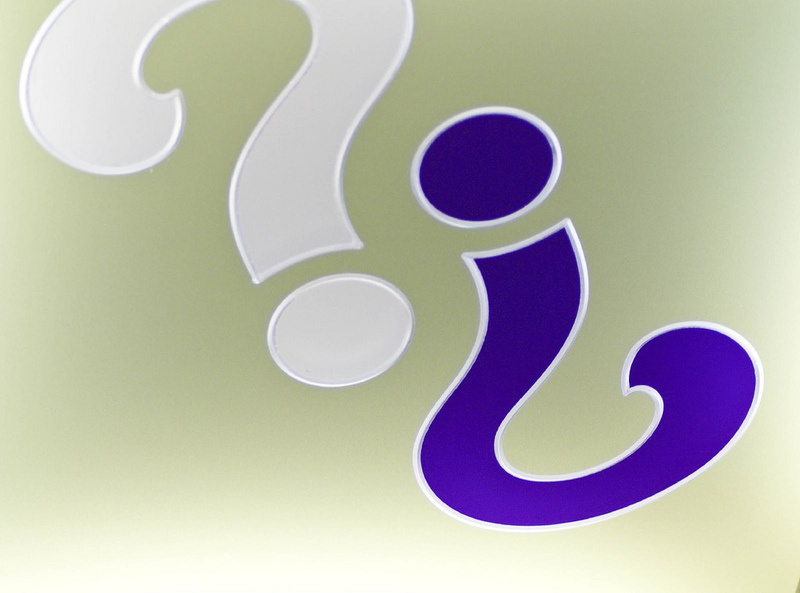 Here are some of the most common questions that we receive about our covers and our standard answers. Q. The cover is too big for my chairs. Do you make a smaller size? While we do not make a smaller SmartSeat, we do have some helpful tips and suggestions for getting a snug fit on smaller chairs. One suggestion is to wrap the back straps of the SmartSeat around the back chair legs more than once to shorten them. Wrapping the straps around the chair legs creates more tension in the straps, allowing you to pull the cover taut across the chair seat and improve the overall fit. Q. Will the SmartSeat work on my office chair? 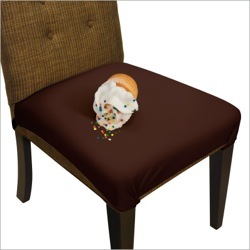 Our covers will certainly do the job to protect office chairs with a central post, but the fit may not be ideal since our covers work best on chairs that have legs around which the back straps can wrap. That being said, we have had customers purchase our covers for office chairs and the feedback that we’ve received is that they had to be a bit creative, but ultimately did get the cover to stay put. Once customer even blogged about using our product to recover her office chair. Q. I’m sure that I’ve installed the cover correctly, but it keeps sliding off the chair. The most commons reason for this issue is that the back straps of the SmartSeat are not correctly wrapped around the chair’s back legs. Wrapping the straps of the cover around the chair’s back legs helps to keep the cover from sliding forward off of the chair. The SmartSeat cover also should be attached tightly to the chair: it should fit like a second skin and should not be loose or baggy. To insure a slide-free and wrinkle-free fit, make sure to pull the straps tightly underneath the chair. Q. The SmartSeat covers my chair upholstery, but the straps are too short to connect underneath the chair. This will sometimes happen with chairs that are on the larger end of our recommended range that also have thick seats or decorative elements around the seat of the chair. If the fabric portion of your chair is covered but the straps will not connect, you can easily create a strap extender by purchasing a package of sticky-backed velcro at a fabric or craft store, or even at some drugstores (the package sells for around $3). If you take the two pieces in the package and stick them back to back, you’ll create one strip of velcro that has the fuzzy side on one side and the prickly side on the other. You can then cut this strip into pieces that are the length you need to make your straps reach. This is a very inexpensive and easy solution that has worked for our customers in the past. Q. I think that I followed the enclosed directions, but the SmartSeat fabric is bunching at the back. Not only should the back straps of the SmartSeat be wrapped around the chair’s back legs, the straps should also be wrapped to the outside of the chair’s back rails. If the straps are threaded through (instead of to the outside) the chair’s back rails, then the SmartSeat fabric will bunch and wrinkle. To insure the best fit, we recommend placing the SmartSeat cover on your chair and aligning the back edge of the cover flush against the back edge of your chair cushion, letting the straps of the SmartSeat drape over the sides of the chair. This will allow you to pull the cover flat against the full width of the chair seat. Next, wrap the back straps around the outside (and then between) the chair’s back legs. Finally, connect the back straps to the front straps underneath the chair seat, making sure that the straps are pulled tightly. Following these steps should give you a smooth and wrinkle-free fit. Q. I’m not sure that the SmartSeat will work for me. Can I try one before making my purchase? While we do not offer covers to customers to try free of charge, we do have a very easy return policy and will gladly take returns within 30 days of the purchase date for a full refund. If you try the SmartSeat, love it, and decide to purchase more to complete your set, we will honor our discount for multiples when you come back to make your second purchase. Q. I’d like to protect my dining room chairs from my cats. Will you SmartSeat covers do this? While we have not done any independent testing to determine how our covers stand up to the wear and tear of pets, many of our customers have positively reported that our covers do a great job of keeping their chairs pet fur-free and protecting their chair upholstery from cats’ claws. You can read more about using our SmartSeats with your pets here. 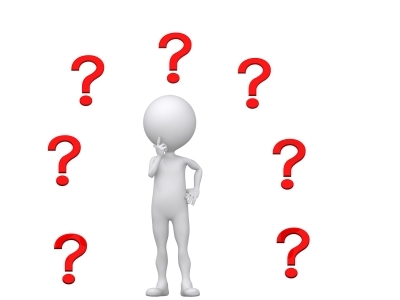 Are you still having problems or are you unable to find the answer to your question? Feel free to send us an email at service (at) pbjdiscoveries (dot) com and we will do our best to help you out! Of course he made a mess….but the cover kept the chair perfectly clean! previous post: Breastfeeding your baby?